Photo By: David Ammon. Pictured: Brandi Karisch, Milton Sundbeck, John Blanton Jr. Established by Milton Sundbeck, founder and owner of West Point-based Southern Ionics Incorporated, the new endowment in the university's College of Agriculture and Life Sciences will facilitate getting research into the hands of producers. Sundbeck is a beef cattle producer and owner of Town Creek Farm, a large beef cattle operation. The farm is dedicated to producing registered Brangus and Ultrablack cattle, hay and wildlife management. George Hopper, dean of the College of Agriculture and Life Sciences and director of the Mississippi Agricultural and Forestry Experiment Station, spoke to the importance of the endowment. "We are grateful to Milton Sundbeck for establishing the first endowed professorship in the Department of Animal and Dairy Sciences," Hopper said. "This gift will ensure that research and extension efforts in beef cattle production will address the needs of small producers to enhance their profitability." John Blanton Jr., animal and dairy sciences professor and department head, said the gift will further advance the department's mission. “The Department of Animal and Dairy Sciences is dedicated to developing science-based solutions to issues facing producers. 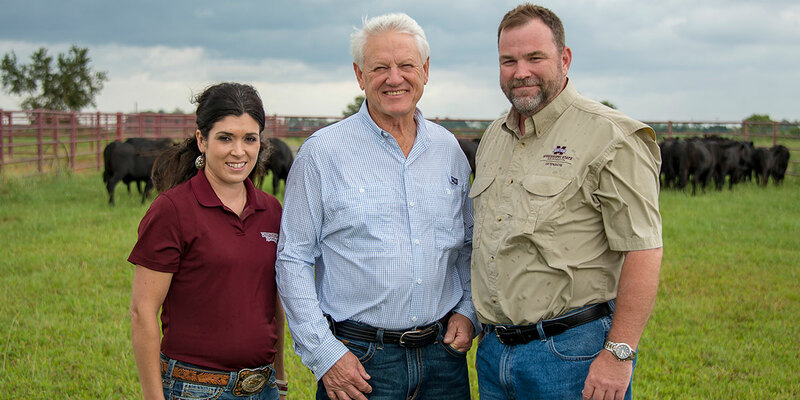 The Milton Sundbeck Endowed Professorship in Southeastern Beef Cattle Management enables the department to advance this mission in beef cattle management," he said. Blanton said that in selecting a scientist for the professorship, Karisch proved the perfect fit. "We needed someone with a proven track record of research and outreach in forage-based beef cattle production with experience solving problems impacting producers in the Southeastern United States. Also, this person needed to have demonstrated success in grantsmanship, as well as having meaningful impacts on producers. Dr. Karisch met or exceeded all of these requirements," Blanton said. Mississippi has 930,000 head of cattle across nearly 16,000 farms, and the combination of small farms, grass-based production systems and warm temperatures many times create challenges for producers in Mississippi and across the Southeast. Karisch, a scientist in the university's Mississippi Agricultural and Forestry Experiment Station, addresses these concerns by researching techniques that producers can apply to their own practices. In addition, Karisch serves as an extension beef specialist, giving her the ability to translate science into best management practices that can be implemented on the farm. "Smaller producers may not always have the means to put certain practices into place, and a goal is to help them find ways to better use their time and efforts. One of our current research initiatives is examining whether altering when vaccines are given can impact the health of calves. Producers understand the importance of vaccination, so this is a practice that can be applied by all producers to improve the health reputation of southeastern cattle," Karisch said. One of her most common recommendations to producers is to use cattle breeds that are well suited to warmer climates. "Breed for your environment: if you live in a warm climate, select cattle that have shorter coats and can cope well with the heat." Karisch regularly communicates research findings to producers in the form of programs and short courses, including an upcoming program aimed at female beef cattle farmers, highlighting handling techniques and other essential skills. During extension programs that highlight new production techniques, Karisch also takes the time to listen to the producers' concerns and challenges, which then drives future research and extension efforts. "Our goal is to help improve the producers' bottom line," Karisch stated. Karisch earned a bachelor's degree from Louisiana State University and master's and doctoral degrees from Texas A&M University. The Department of Animal and Dairy Sciences offers a bachelor's degree with concentrations in business and industry, production management and science/veterinary science. Master's and doctoral degrees also are offered in agriculture and agricultural sciences. The department includes faculty members in the College of Agriculture and Life Sciences, the Mississippi Agricultural and Forestry Experiment Station and the MSU Extension Service. Learn more about the Department of Animal and Dairy Sciences at www.ads.msstate.edu.